Some of the major companies in therapeutic vaccines market comprise BioVex, Inc., Valeant Pharmaceuticals, Immunocellular Therapeutics, Ltd., Inovio Pharmaceuticals, Inc., GlaxoSmithKline plc., Agenus Inc., Novartis AG, Argos Therapeutics, Pfizer Inc., Transgene, Bavarian Nordic, Vaccinogen, Inc., and Galena Biopharma among others. These players are set to bolster the therapeutic vaccines market. As per analysts at Zion Market Research, global therapeutic vaccines market was capitalized at almost USD 10.54 Billion in 2016 and is likely to create income of almost USD 47.44 Billion by 2022, developing at a CAGR of almost 28.5% from 2017 to 2022. Global therapeutic vaccines market is majorly fostered by increasing occurrences of chronic diseases such as HIV and cancer all over the globe, as per analysts at Zion Market Research. 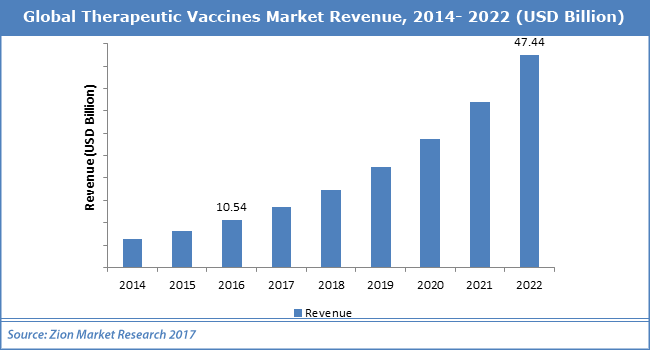 Other major boosting factors for therapeutic vaccines market are growing funds from the government for R&D of vaccines paired with technological advancements. For example, in April 2018, the Four-strain vaccine Influvac Tetra (dubbed as a quadrivalent vaccine,) developed by Mylan was made available in New Zealand. On the other hand, stringent regulatory policies and high cost of treatment paired with high capital investment at the beginning are the major limitations that may hinder the development of the therapeutic vaccines market. Nonetheless rising focus on customized medicine paired with the requirement for effective therapy are expected to reveal the new opportunities for development therapeutic vaccines market in the forecast period. In addition to this, elevating job opportunities is also set to foster the development of therapeutic vaccines market. Based on product type, the therapeutic vaccines market is divided as autoimmune disease vaccines, addiction vaccines, neurological disease vaccines, and infectious disease vaccines. Autoimmune disease vaccine section is likely to develop at quickest rate in the therapeutic vaccines market in the near future. The therapeutic vaccines market is divided on the basis technology into allogeneic vaccines and autologous vaccines. Europe, North America, Latin America, Asia-Pacific, and Middle East & Africa are major areas of global therapeutic vaccines market. North America is likely to stay the dominating area in the near future. It will be followed by Europe. Requirement for therapeutic vaccines was uppermost in North America particularly in the U.S. Asia Pacific is likely to be the moderate developing area during the forecast period in therapeutic vaccines market. Furthermore, Latin America and the Middle East & Africa are also likely to show reasonable development for therapeutic vaccines market in the coming years.